At AmishOutletStore.com, we believe the best interior design is all about the smaller details. From the material used to a piece’s functionality, those small details come together to make a living space you should be proud to come home to every single day. Amish handmade furniture is beloved around the world for its attention to detail, and of course, the quality of its construction and design. Our Shaker-style corner TV stands are a fine example of why Amish craftsmanship is a perfect fit for many types of living styles. With their distinctive, beautiful design and high-quality wood materials, our Shaker-style corner entertainment centers check off all the boxes for the perfect living room piece. 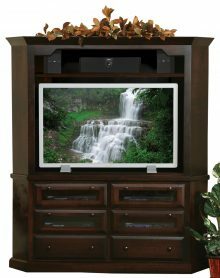 Like all products available at AmishOutletStore.com, our Shaker-style corner TV stands provide customizable options. Choose from our gorgeous wood types, including oak, cherry and Q.S. white oak. Once you’ve found the wood type that best matches your existing décor, you can also choose from our extensive selection of wood stains, all of which are available for you to sample. Your Shaker-style corner TV stand will be built by one of our highly-skilled, expertly-trained Amish artisans. At AmishOutletStore.com, we do not use cheap materials. 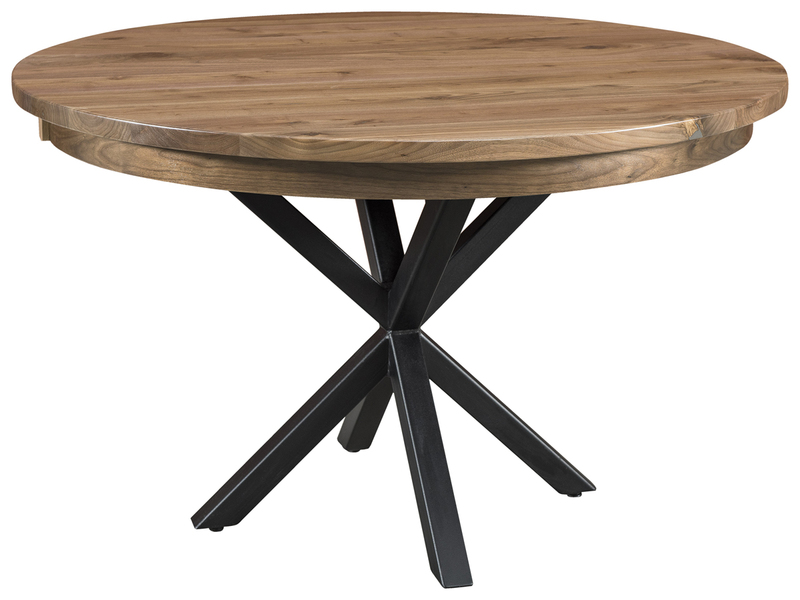 Instead, each of our products feature high-quality wood, and they are built with the finest materials and tools. 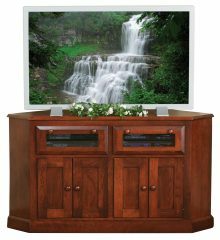 Our Shaker-style corner TV stands and entertainment centers are built to last for years of enjoyment. With beautiful craftsmanship and structural integrity, this style of entertainment center stands the test of time and regular use. With proper care, many generations of your family can enjoy the benefits of your custom-built Amish handcrafted piece. We’re proud to offer up to 33% off our Shaker-style corner TV stands when you shop online today. As you explore our many collections and styles, feel free to reach out to us at any time with questions. It’s always our pleasure to help you find the perfect fit for your home. 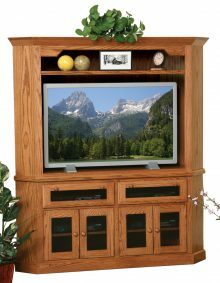 Take advantage of the finest Amish craftsmanship today by buying your very own, Shaker-style corner TV stand from AmishOutletStore.com.